Charming holiday home with a large outside open entertaining deck at the front plus a covered deck at the rear. Open plan kitchen, dining and living - with heatpump and freestanding fire - should the weather gets abit nippy. A combined laundry/bathroom with a seperate toilet. The gardens and trees make this property really serene and private, so if you are wanting a break and need a place to just relax but still be within walking distance to town - then you need to book your next stay here. (Please note: Are unable to load more photos due to the weather - will endeavour to have interior and more exterior photos on site within the next couple of days). Nice and quiet. Comfortable. Could do with a bbq and a toaster! Also couldn’t get the oven to work. Great bach if you want lovely tranquil surroundings and treescape from the deck. Great bach if you want lovely tranquil surroundings and treescape from the deck. The house has a great living space and kitchen and the two bedrooms are adequate for a nice kiwi holiday. 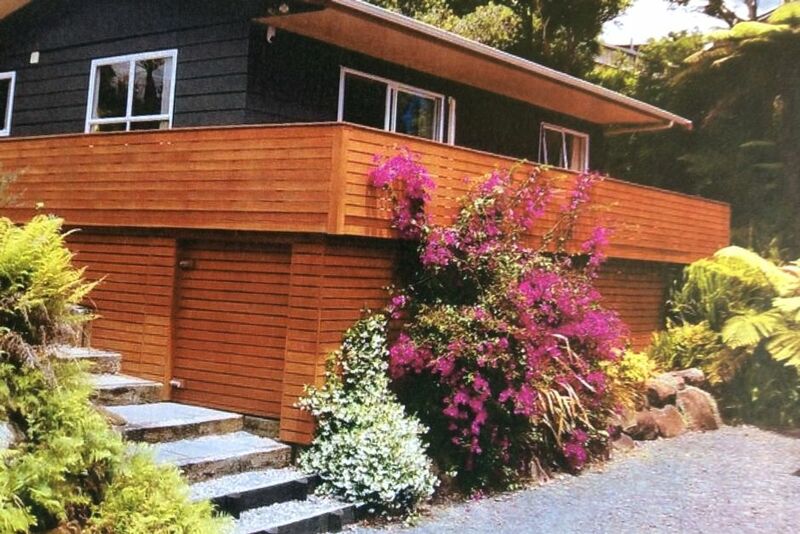 Both front and back decks are very useful, I would recommend for a great relaxing kiwi getaway.